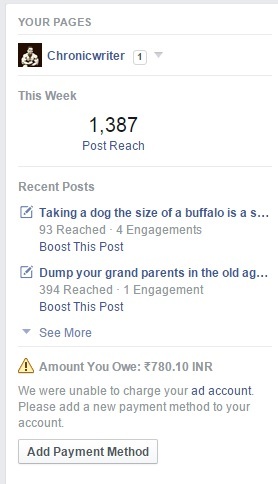 When I opened my Facebook Fan page that I maintain for this blog, I discovered that I owe Rs 780.10 to Facebook. I was stunned for a moment. Later I realized that I had run a campaign to promote a post on Powerstar for two days. Sadly the payment method I added to the account did not synchronize well with Facebook. Now every time I open my Facebook account I am reminded that I am a kadan kaaran (debtor) to Facebook. I just told Mark through telepathy the following words "Machaaan Accountla Vachuko da" which in English translates to " I shall pay back soon"
It also reminded me of the number of people to whom I owe money. Sultan Bhai had a small hotel in the little union territory- Pondicherry. His hotel was next to the house where I stayed in the 3rd and 4th year of my Engineering college days. During those days, our pocket moneys would range between Rs 1000 to Rs 2000. For the food alone, Rs 600 will be used by us in a month. For the Rs 600 we give to Sultan Bhai, we had the privilege of eating breakfast and dinner from his hotel. On Saturday nights, he would treat us with chicken leg pieces. 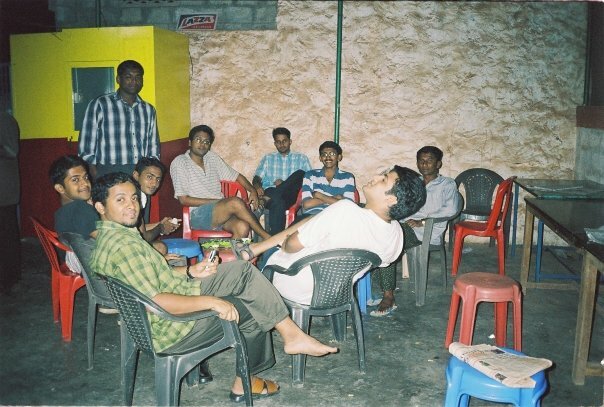 Saturday nights are usually the time of the week, when all men in Pondicherry will be floating in high spirits. So we will never miss the chicken leg piece on Saturday nights. On the first Sunday of every month, he will treat us with yellow rice. He would call that as Hyderabad Dum Biriyani. But we knew that it was just yellow rice. After I finished college, I did not give Rs 20 to Sultan Bhai. I still owe him that money. Now it has been more than 12 years. I will repay my debt sometime when I visit Pondicherry. Ikka! That's how we call him. I do not know his real name. Ikka had a small petty shop near the boys hostel in Rajagiri School of Management ( Now Rajagiri College of Business Studies) where I did my MBA. Ikka was an amazing businessman. He just had a petty shop when I started doing my MBA. The petty shop had soft drinks, some biscuits and cigarette packets. They were sold to the hostel boys. Within 6 months he made a huge profit that made him to convert his petty shop to a mini hotel. The boys are sitting in the mini hotel in this picture. Ikka also did door delivery services to all the boys whose room was near his shop. My room was very close to his shop and I was one of the privileged souls to get door delivery package from Ikka. I still owe Rs 12 to Ikka. I also owe money to a few others. I am just trying to recollect all the names of those who have invested time, energy and money in my life. I have to repay them all. When I think about repaying with kindness, the Airtel ad comes to my mind. The advertisement is so beautifully done that it makes us have that pleasant feeling every time we see that ad. The manner in which the four people in the ad brings a smile back on the face of the ice cream vendor uncle is beautifully portrayed in the ad. Kudos to the ad makers for bringing out a good advertisement amidst all the crap we see on TV in the name of ads. I would not be doing justice to this post, if I do not write about Sharon in this post. Sharon was a great friend of mine in school. We have shared lunches and loads and loads of secrets. When we were in class 10, Sharon borrowed Rs 10 from me which was never returned to me all these years. After almost 20 years, I happened to meet Sharon earlier this year. We caught up with all the wonderful things that we did in school. Finally before we said good bye, Sharon came to me and said "Chriz, Do you remember that I borrowed Rs 10 from you during our tenth standard days? I have to repay that money to you now". When Sharon handed me that Rs 10 currency note, I had goose pimples. When I came home, I narrated this incident to my folks and happily showed them the Rs 10 note that Sharon gave to me. As I was showing the Rs 10 note around, my daughter came to me and pointed at a picture drawn on the note and asked "What is this Appa?". 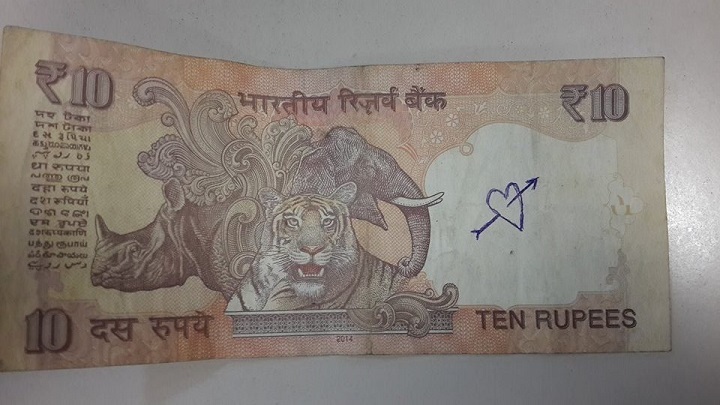 Soon all the family members zoomed their eye lenses to the picture drawn on the Ten Rupee note. It was a picture of a Heart with an arrow piercing through it. All of them gave me a very dirty look and left me to fend for myself. I did not know how to react. Note: Sharon is a boy and that is why I am even more confused now. Chriz, i could not stop laughing. why on earth its always something happens to you like this. Vadivelu marri evlo adichalum thangara nee. Keeping the suspense of Sharon' gender till the climax was the biggest challenge while writing this post. I had to edit and redo that paragraph a couple of times before it came right. The funny thing is that a few failed to read the note part.